American industry geared up to become . . . This typical Ordnance Dept. poster was intended not only to boost morale but arms production as well. An Army platoon leader (below) fires his Ml Rifle during the fierce street fighting in Saarlautern, Germany, in February 1945. Sixty-four years ago, with Europe at war and America on the brink, our inventory of modern small arms was as pathetically short as was the personnel roster of our Army Ordnance Dept. (AOD). That department had the task of procuring and supplying all ordnance to the Army and most of the small arms and ammunition used by all our services plus, as it turned out, much of such material used by our allies. In 1919 the AOD had 1,885 officers and 8,172 enlisted men. By early 1939 those figures had shrunk to 287 officers and 2,776 men. Non-allocation of defense funds and a sense of false security were the obvious, and by now familiar, reasons for the peacetime cutback to less than statutory strength. The AOD had made few significant arms acquisitions since World War I, and much of what had been left over after that conflict was obsolescent and stashed away with little thought that it would ever be needed. A comprehensive list of what was in Army use or storage in 1939 was not found in this research, but some official data (often contradictory, always incomplete) were noted. These data, adjusted for Navy, Marine Corps and Coast Guard inventories and influenced by estimates from knowledgeable sources, suggest the following approximate quantities of serviceable small arms on hand. Most, excepting the M1s, M1903s, .22 Trainers and a few M1911s, were of commercial origin, and there were also smaller quantities of assorted, commercially acquired pistols, revolvers, rifles and shotguns used for various purposes. On Sept. 8, 1939, with the Nazis in Poland and with France and Great Britain having declared war, President Roosevelt declared a state of Limited National Emergency and directed the Army to bring itself and its armaments tip to proper strength. At that time AOD controlled but six manufacturing arsenals that were "active" only by an optimistic use of the word: Ordnance officers estimated that the six establishments could make only about 5 (7 of what would be needed if the U.S. went to war. Springfield Armory was producing token quantities of the Ml Rifles that were listed as the Infantry`s first priority. Frankford Arsenal was the prime manufacturer of small arms ammunition but also made artillery projectiles, cases, pyrotechnics and various gauges and instruments. Watervliet Arsenal specialized in cannon; Watertown Arsenal in gun carriages; Rock Island Arsenal in carriages, artillery recoil mechanisms and combat vehicles, and Picatinny Arsenal in artillery ammunition, explosives and propellants. By mid-June of 1940, the Nazis had occupied the Low Countries, Dunkirk had been evacuated and France had fallen. Churchill had become Prime Minister, and President Roosevelt had declared a State of Full Emergency. Then funds and more funds were made available, and soon AOD came to manage the largest manufacturing program in the world. From 1940 to 1945 it spent a total of $46 billion of the total U.S. wartime expenditure of $350 billion, and much of that went to private manufacturers. "From Pearl Harbor to V-J Day the Industry-Ordnance team furnished to the Army and 43 foreign nations 47 billion rounds of small arms ammunition, approximately 11 million tons of artillery ammunition, more than 12 million rifles and carbines, approximately 750,000 artillery pieces and 3/2 million military vehicles." Campbell had reason to be proud, and the Allies thankful for this record, but he didn`t name all the weapon types or their makers, or mention the development of new types during the war. Nor did he comment on the sales and donations of small arms that were made directly to our allies, bypassing AOD. The small arms supplied before Lend Lease went into effect were almost all of private manufacture. The transactions, some secret and some of questionable legality, were handled through government channels or had real or implied government approval. Examples of large pre-Lend Lease British orders included Stevens-made No. 4 Enfields, off-the-shelf Colt pistols and revolvers of all descriptions and Smith & Wesson .38/200 revolvers; Thompson submachine guns were ordered by the French and the British, and Johnson machine guns and rifles were ordered by the Dutch. Immediately after the Dunkirk evacuation, AOD`s inventory was reduced by massive shipments to England that included 865,000 M l917 rifles (plus 270,000 more by February 1941), 25,000 BARs, 86,000 machine guns, 25,500 revolvers and 144.5 million rounds of ammunition (See American Rifleman, January 1988, p. 34). When Lend Lease began, the U.S. Armed Forces were at strength of less than a million; by 1945 that strength had been increased 12-fold, and the necessary arms had to come from somewhere. U.S. industry met the demand. Olin Industries Inc.`s Winchester Repeating Arms Co. had a jump on its competitors, for it had been given an `educational order" by AOD in 1939 for 500 Ml Rifles. Those it completed rapidly and went on to make a total of over a half-million. This was dwarfed by Springfield Armory`s total of over 3.5 million, but the Garands were only part of Winchester`s contribution. It designed the .30 Carbine cartridge to Army specifications and designed and made the first working model of the U.S. Ml Carbine itself in a matter of days in August of 1941. More than 800,000 Winchester Ml Carbines plus 17,000 M2s were made. John M. Olin stated in 1945 that, aside from the Ml Rifles and Carbines, Winchester supplied the Allies with "hundreds of thousands of training and guard weapons" including Model 75 .22 rifles and Model 12 shotguns. Olin`s Western Cartridge Co. Division made "hundreds of millions" of 7.92 mm Mauser cartridges for the Chinese; Winchester made like quantities of .303s for the British. Both made other types as well, bringing their combined wartime ammunition total to almost nine billion rounds. Olin`s subsidiary, the United States Cartridge Co., engineered and operated the giant St. Louis Ordnance Plant that produced over six billion rounds. .38/200 S & W rev. Data from Ian Skennerton`s The U.S. Enfield. The government-owned, contractor-operated plants became not uncommon and were referred to by the acronym GOCO. Federal Cartridge Co. operated the Twin Cities Arsenal that produced more than four billion rounds of military ammunition, and it also made shotshells and rimfires on its own. Du Pont, in July 1940, was the first firm to be awarded a GOCO contract for a smokeless powder plant that later be came the Indiana Ordnance works. Hercules Powder Co. received its GOCO contract in the following month. Du Pont`s Remington Arms Co. established and operated five new GOCO ordnance plants, Denver, Kings Mills, Lake City, Lowell and Utah, accounting for over 16 billion rounds of standard military ammunition of 33 types. Remington supplied a combined total of over 60,000 Model 1 IA, Sportsman and 31 shotguns for aerial training with more than 5,000 traps, millions of clay birds and half a billion rounds of shotshells. Two billion rimfire cartridges and thousands of Model 513-T .22 rifles were also supplied for training. Remington also found time, in late 1941, to start making Ml903 Springfield rifles on old U.S. arsenal equipment. These were originally intended for the British, but soon the U.S. required them too. Then, in 1942, the simplified M1903A3 was developed to be followed by the sniper version, the M1903A4. Estimates vary, but a total of 364,954 M1903s (some modified), 783,844 M1903A3s and 29,964 M1903A4s are reported as Remington-made, in The Springfield /903 Rifle by Lt. Col. William S. Brophy. To Remington`s 1,178,762 Springfield output must be added the 236,831 M1903A3s made by the L.C. Smith-Corona Typewriter Co. in 1943. The L.C. Smith name of Smith-Corona was that of the famed shotgun figure Lyman Cornelius Smith, but Smith himself was always more interested in typewriters than guns and, having died in 1910, had no connection with the Ml9O3A3s. The Smith-Corona rifles were made in the firm`s Syracuse, N.Y., factory using barrels made by the High Standard Mfg. Co. of Hamden, Conn.
High Standard, a small firm of 170 employees at the war`s start, went on to make barrels for many guns ranging from the Ml911 pistol to the .50 Browning machine gun. It grew to a force of some 4,000 employees in short order, having taken a 1941 British order for 12,000 .50 cal. Browning aircraft machine guns. Other Brownings were later delivered to AOD requirements, as were 14,000 Model B and 44,000 Model HD .22 semi-automatic pistols. Not all the HDs were used for training, however, as High Standard also provided 2,000 silencers for them. High Standard`s Carl G. Swebilius had patented a submachine gun in 1940 that came to be known as the UDM `42. Prototypes in .45 ACP cat. were made by High Standard, but volume production was undertaken in 9 mm by Marlin Firearms Co., with sales rights going to the United Defense Supply Corp. The history of the UDM `42 is cloudy, but over 15,000 are known to have been made by Marlin, sold through UDSC, paid for by the Netherlands Purchasing Commission and subsequently resold to the U.S. government. Some were used by the Office of Strategic Services (OSS) and most, it is said, were dropped into occupied France in 1944. Marlin made huge quantities of parts, including barrels, stocks and handguards for the MI Carbine and barrels for the Ml Rifle. It was also the unlucky manufacturer of the M2 submachine gun that saw its government contract canceled in favor of the Ml Thompson and M3 "grease gun" at the outset of its production. No more than 500 M2s were made. Auto-Ordnance did far better in the submachine gun field with its legendary Thompsons. In early 1939 Auto-Ordnance had no manufacturing facilities and was doling out the last 4,000 of the single lot of 15,000 Thompsons that Colt had made under contract in 1921 and 1922. Only 1,500 were in the U.S. inventory. Then, in June, the U.S. Army took another 950 guns and, in November, the French Purchasing Commission ordered 3,000. The British wanted many too, but Colt may have felt that the "Tommy Gun" had tarnished its reputation in the `30s and, having other commitments, declined to resume production. Auto-Ordnance contracted with Savage Arms Corp. to make the Model l928Al in December 1939. Savage, using the old tooling and machinery that had been stored at Colt since 1922, began deliveries in April 1940. By the end of the year, the British had ordered 107,500 guns, the French an additional 3,000 and AOD 20,450. By 1941 orders were flowing in from every quarter, and Auto-Ordnance opened its own plant in Bridgeport, Conn., to supplement Savage`s production. The gun was simplified during the war so that the Models 1928A1,Ml and M1A1 were all in Allied inventories when production ended in 1944. The totals produced during the war amounted to about 500,000 by Auto-Ordnance and 1.25 million by Savage. Savage`s Utica, N.Y., factory also produced about 300,000 .50 and 15,000 .30 cal. Browning machine guns plus 25,000 Model 720C Savage shotguns for training. Savage`s Stevens Division in Chicopee Falls, Mass., made more than a million .303 cal. No. 4 Lee Enfields, primarily for the British. Approximately 16,000 Model 620 Stevens pump shotguns, and 48,000 of the older 520s plus 16,000 .22 rifles, mostly Model 416s, were provided for training; the shotguns were also used by guards. The Tenite-stocked Stevens .22/.410 over-under combination gun was adopted by the U.S. Army Air Force as its first "survival gun," and more than 15,000 were ordered. OF. Mossberg & Sons, Inc. got into the survival field also with a 10" smoothbored barrel for the .45 M1911A1 pistol. It came too late to be of benefit in the war as it was adopted only in late 1945, but it was the least of Mossberg`s efforts. Large numbers of parts for Browning .50 cal. machine guns and Lee-Enflelds were produced and AOD procured 46,000 Mossberg Model 42MB and 57,600 Model 44US .22 bolt-action training rifles from the (then) New Haven, Conn., firm. Mossberg` s neighbor in Middlefield, Conn., the Lyman Gun Sight Corp., made no guns but supplied hundreds of thousands of sights for trainers plus 100,000 Thompson rear sights. Some 25,000 M73, M81 and M82 Lyman (Alaskan) scopes were made for snipers (many were used on M1C Rifles with Griffin & Howe mounts) and 20,000 Cutts Compensators went to the Army and Navy for installation on training shotguns. Lyman target scopes were adapted for signalling devices, for testing power-operated turrets and were used on guns for sinking floating mines. Non-standard Lyman products included components for the Springfield and Enfield rifles and the Ml Carbine. The W.R. Weaver Co. supplied Nash-Kelvinator and Westinghouse with prisms and lenses for binoculars and provided snipers with thousands of its 2.5X Model 330-C scope sights with the military nomenclature M73B1. With Redfield mounts the M73BI was used on the M1903A4 rifles. Marine snipers used 8X scopes mounted on prewar Ml9O3Al rifles. The scopes were no more, and no less, than the premium target scopes made by the John Unerti Optical Co. of Pittsburgh, Pa. A total of 3,500 were ordered during the war that ended before all the scopes had been delivered. Many other types of optical equipment were supplied by such firms as Wollensak of Rochester, N.Y., (M82 scopes, binoculars and spotting scopes), Argus of Ann Arbor, Mich., (spotting scopes) and the best-known such firm, Bausch & Lomb. B & L made binoculars of all types, spotting scopes, range finders and countless other more sophisticated devices. But B & L`s most evident products were its relatively simple Ray-Ban "goggles," as they were known, that were used in all branches of the service. If B & L was and is well known outside shooting circles and considered a "large" firm, so were and are the General Electric Co., the Chrysler Corp. and General Motors Corp.
GE`s product of interest here had a 2.36" bore in its 54" barrel but was still a small arm" by AOD standards as it was shoulder operated. The 1942-introduced "Bazooka" was the Infantry`s surprise gift to the Axis and must have surprised AOD also. It asked GE to make the first rocket launchers in 30 days. GE spent half that time making and testing 14 prototypes, and the other half in completing the initial order of 5,000 pieces. It went on to make 450,000 Bazookas and was joined in its manufacture in 1944 by the Cheney, Bigelow Wireworks of Springfield, Mass., that added 40,000 to the total. Chrysler`s main lines were, of course, devoted to vehicles, but under a GOCO contract it operated the Evansville Ordnance Plant that was the largest producer of .45 ACP ammunition in the war. General Motors` massive resources coupled with the cooperation of many subcontractors enabled it to deliver millions of motors, of course, but also vast quantities of airplane, tank and landing craft engines, complete airplanes, tanks and trucks and 120 million artillery shells. In small arms GM`s output was also impressive. More than a half-million Ml Carbines were made by GM`s Saginaw Steering Gear Division plants in Michigan and more than two and a half million (including 140,000 M1A1s and 200,000 M2s) by its Inland Manufacturing Division in Ohio. GM`s Guide Lamp Division, the stamped metal experts of the day, produced the Inland-designed M3 and M3A1 submachine guns in quantity from 19431945. The totals are estimated to have been over 605,000 .45 cal. M3s, 25,000 9 rum M3s and 15,000 .45 cal. M3A1s. Guide Lamp also made the one million "Liberator" .45 cal. single-shot pistols designed for OSS drops to resistance forces. (The OSS also designed and ordered over 25,000 "Stingers," originally called "Scorpions" from Rite-Rite Mfg. Co. of Downers Grove, Ill. These fountain pen-sized clandestine devices were supplied pre-cocked and pre-loaded with a single .22 Short cartridge). Other GM Divisions, Saginaw, Frigidaire, AC Spark Plug and Brown, Lipe, Chapin cooperated to produce 1.25 million .30 and .50 cal. Browning Machine Guns. In addition to the already-named Browning Machine Gun contractors and Rock Island Arsenal, BMGs were made by the newly formed Buffalo Arms Corp., the Kelsey-Hayes Wheel Co. and the prime prewar contractor, Colt. Because of its involvement in the development of a 20 mm automatic cannon and its production of thousands of 37 mm anti-aircraft guns and aircraft cannon, Colt`s small arms programs were not as proportionately huge and varied as they had been in World War I. Aside from its .30 and .50 cal. Brownings, many used by the British, its 1940`45 small arms were all handguns. About 50,000 .38 SpI. Commando revolvers, wartime-finished versions of the Official Police model, were delivered on government contract. They came to be used by all the services but were also issued to defense factories and the Maritime Commission. Many of the commercial revolvers made in those years ended up in government hands; the Coast Guard, among others, purchased Service Model Ace .22s for training; Woodsman .22s were used to some extent by both the Army and the Navy; some 17,000 .32 ACP cal. and 3,500.380 ACP cal. "Model M" pocket semi-automatics were issued, some as general officers` pistols and some to the OSS. But the best known Colts were the M1911A1s. 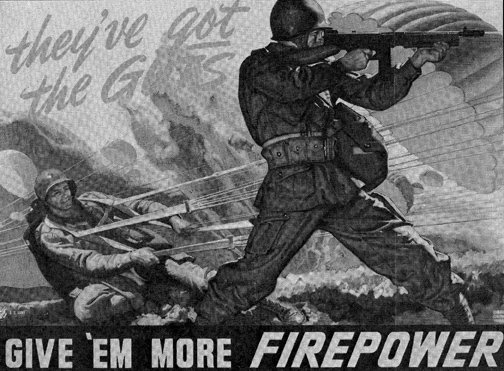 A total of nearly two million of the .45s was produced in the war years--never enough for demand but far too many for Colt that, despite being plagued by labor problems and despite its other contracts of higher priority, made about 480,000. Remington Rand Inc., the New York City typewriter firm, that built a new factory in Syracuse to produce about 1,032,000; Ithaca Gun Co. that, in addition to supplying thousands of Model 37 shotguns for training, made about 369,000; and Union Switch & Signal Co. of Pennsylvania that made 55,000 in addition to many Ml Carbine receivers. Colt-made Browning Automatic Rifles, or BARs, had been used since the end of World War I, but supplies were short and demand was high. Six private firms--International Silver Co., Blake Mfg. Co., Elliott Addressing Machine Co., National Blank Book Co., A.G. Spalding & Bros. and Boston Wire Stitcher Co.joined together to form the New England Small Arms Corp. and to produce 168,000 BARs. Another 20,000 BARs were made by the substantial, but not then overwhelming, International Business Machine Corp. that was already making munitions ranging from aircraft cannon to Ml Carbine components. IBM would have made more BARs, but its contract was canceled after only a few weeks` production in 1943. AOD replaced the BAR order with one for complete Ml Carbines, of which IBM eventually made 346,500. Other private firms that made substantial quantities of Ml Carbines included the typewriter firm Underwood-Elliot Fisher (around 545,000); the juke box maker Rock-Ola Mfg. Corp. (228,000); Quality Hardware Machine Corp. (359,000); National Postal Meter Co. (413,000) and Standard Products Co. (247,000). All the above six firms made standard Ml Carbines; only Winchester and Inland made the M2s and only Inland the M1A1s. Harrington & Richardson made what amounted to .45 cal. alternates to the .30 cal. M1A1s and M2s. They were used mainly by our Marine Corps, but some of them went to Russia, Canada and elsewhere. The Eugene Reising-designed H & Rs were made in two versions, both having selective-fire delayed blowback mechanisms, both chambered for the .45 ACP cartridge and both useable with 12or 20-round magazines. The Model 50 had a conventional wooden stock; the Model 55 used a folding wire buttstock designed for paratroopers. A total of more than 80,000 Model 50 and 55 "Reisings" were made from 1941 to 1945. H & R provided the Army and Navy and Coast Guard with quantities of the MS Very pistols and line throwing guns based on its single-barrelled shotgun design. The H & R Model 65 .22 semiautomatic was a trainer lookalike of the Model 50 Reising, and it too was adopted by the Marines. An official of H & R stated in 1945 that many .22 cal. revolvers were supplied by the firm for training and "flyers` emergency kits," and H & R single-barrelled shotguns were provided for "native rubber workers." For the British police, H & R made large numbers of .38 S & W or .38/200-chambered "Bobby" revolvers that were also supplied to U.S. defense plant security forces throughout the war as the Defender Model. The bulk of the .38/200 revolvers, of course, were those made for the Allies by Smith & Wesson. Particulars of these and their .38 Spl. Victory Model counterparts can be noted in the April 1989 American Rifleman. It will only be said here that S & W delivered more than 1.1 million M & P variations during the war. S & W had no facilities to do more and lost some time in 1940 in making a run of about 1,200 semi-automatic 9 mm carbines for the British. The S & W Light Rifles worked well with American but not European ammunition and were too costly to stand much of a chance of military success. The guns designed by Col. Melvin M. Johnson, Jr., had better luck. Johnson, a captain in the Marine Reserve, tried to have his rifle accepted by AOD as a replacement or running-mate for the Garand in 1938. A long controversy finally gave the nod to the Garand for various reasons but judged the Johnson a fine rifle nevertheless. the Dutch rifles went ahead rapidly with the aid of subcontractors, and a Dutch order for Johnson Light Machine Guns was given in 1941. In that same year, the undersupplied Marine Corps also ordered the machine guns for its paratroopers and Raider units and, in 1943, the U.S. Army`s First Special Service Force was issued Johnsons. The FSSF, an elite Canadian-American task force trained as commandos and paratroopers, disturbed the Nazis sufficiently to be christened by them "The Black Devils of Anzio." machine guns were made from 1941 to 1944. While the U.S. had relegated the sword to ceremonial status by 1939, many other types of edged tools were used and issued in often unrecorded quantities. Each rifle had its bayonet, but the Ml Carbine came by its bayonet attaching lug only in 1944. That didn`t keep early carbine users from wiring knives to the carbine barrel or from carrying a knife of official or unofficial pattern, and few fighting men were not equipped with an edged weapon of some sort. They were supplied to and through AOD and the Quartermaster Corps; to the OSS; to the Navy and Marine Corps and by America`s cutlers in profusion. The types ranged from 18"-, 22"- and 26"-bladed rigid machetes by Case, Collins, Disston, Queen City, Robeson and True Temper, for jungle clearing, through bayonets and trench knives, to Schrade`s M2 "switch-blades" for paratroopers. Thousands of the many variations of pocket knives (notably the TL-29 for the Signal Corps) were made by numerous commercial firms. Bolo-type tools were made for medical corpsmen and marked U.S.M.C. with the name of the makers: Briddel, Chatillion, Clyde or Village Blacksmith. Bolo/Bowie survival knives were obtained from Case, Collins and Imperial; folding machetes came from Camillus, Case, Cattaraugus and Imperial. The OSS ordered unmarked leaf-shaped bolos from Case known as "Smatchets." Navy and Army flyers had hook-shaped floating life raft knives made by Western States Cutlery, and the Navy equipped its life rafts with outsized folding saw/ knife combinations made by the United and the Colonial Cutlery companies. The above were all designed as general purpose tools, were all made by private firms and were all intended more to protect than to take lives, though many, along with "edged" entrenching tools, probably served as weapons. The same can be said for the Navy`s Mark I knives that were no more than 5"-bladed commercial hunting knives. which it was designed; Marine Raider battalions obtained similar stilettos patterned after the British-made Fairbairn-Sykes knives that were issued to the U.S. First Ranger Battalion; and many of the U.S. servicemen stationed in or passing through England bought their own "F-S Fighting Knives" through commercial channels. Many home workshops in the U.S. turned out fighting and utility/fighting knives for our troops. In most cases the knives were gifts from the maker or the serviceman`s relatives. Two of the small shops--those of W.D. Randall, Jr., and John Ek--survived and prospered and today are world famous. Probably the most famous knives of World War II were the Marines` KA-BARs, so named for the Union Cutlery Co. brand name that accompanied the USMC marking on most of them. Camillus, Pal and Robeson made some of the 7"-bladed fighting utility knives for the Marines also. Almost identical knives were made and marked for the Navy as its Mark II by the same and other makers. A dozen private firms made the 2.5 million M3 Trench Knives and 7.5 million "M1942," Ml and M4 Bayonets that supplemented the Mark I Trench Knives and M1905 Bayonets left over from World War I. The bayonets that interchanged on the Springfield and Garand rifles were made by American Fork & Hoe, Oneida Ltd., Pal Blade & Tool Co., Union Fork & Hoe, Utica Cutlery Co. and Wilde Drop Forge & Tool Co.
M3 knives and the M4 knife bayonets that replaced them came from America Cutlery Co. (M4 only), Boker, Camillus, Case, Imperial, Kinfolks Inc., Pal, Robeson, Utica and perhaps others. Each knife and bayonet had to have a sheath or scabbard; each pistol and revolver had its holster. Again, private firms turned out adequate numbers. The National Rifle Association became a producing industry itself during the war with government-issued and recommended manuals, wall charts and films on such subjects as Defense Plant protection, pre-induction basic small arms training, range construction and practical shotgun instruction. The headquarters staff was cut in half by enlistments and the American Rifle man halved by paper shortages. Guns were collected from NRA members for the British Home Guard that, by 1941, had grown to a strength of 1.5 million men armed no longer with pikes and maces but with rifles and pistols. The NRA members too young or too old to enlist or frozen in war-essential industrial or police jobs were, in effect, the backbone of our own Home Guard. Recent confirmation of the value of the NRA and its cooperation with the Director of Civilian Marksmanship (DCM) appeared, oddly enough, on page A23 in the Washington Post of July 26, 1989. "An Army study found that 1.7 million GIs who served in World War II had participated in DCM clubs." The Congressional Medal of Honor was given to members Col. (later Commandant) David M. Shoup, USMC; Cdr. John D. Bulkeley, USN, and 2nd Lt. Audie L. Murphy, USA, the most decorated soldier of the war, and to two men who became NRA Presidents: Brig. Gen. (later Maj. Gen.) Merrit A. Edson, USMC and Capt. (later Brig. Gen. and governor of South Dakota) Joseph J. Foss, USMCR. Without the men behind them, the vast amount of armaments put out by U.S. industry would have proved nothing; without their guns the Allies could not have fought and the world would today belong to the Axis. The Encyclopaedia Britannica (1958), using a quotation from President Roosevelt, summarized this phase of history`s most devastating war: "It was U.S. industry which was called upon to equip and support not only U.S. forces, but considerable portions of allied forces, and it earned the title of the arsenal of democracy." This story was originally published in the December, 1989 American Rifleman.